Dropbox changed public folders to shared folders. They have been emailing that the change was coming for months now. The plugin will need updated or you need to change your public folder permissions. So, IFTTT can't access the files unless I change the view permissions? I see the filse are uploaded when they should. The triggers are working nice. I will have a look. Just to be clear on the problem: the plugin creates the text file in the Dropbox but IFTTT does not pick it up? or is it the other way around? IFTTT does not pick up the changes, yes. The file is created just fine. Dropbox did some changes to the "public" area, and I can't for the life of me figure out what I need to do to make IFTTT see the change. I tested with some old IFTTT applets and saw some strange things, but then I recreated 2 applets from scratch to test both public and private folders, and it seems to work. - Overwriting an existing file in your dropbox (or even uploading a file with a name that existed before but that you deleted) does not seem to work consistently. It worked for me yesterday, but it doesn't seem to work this morning. 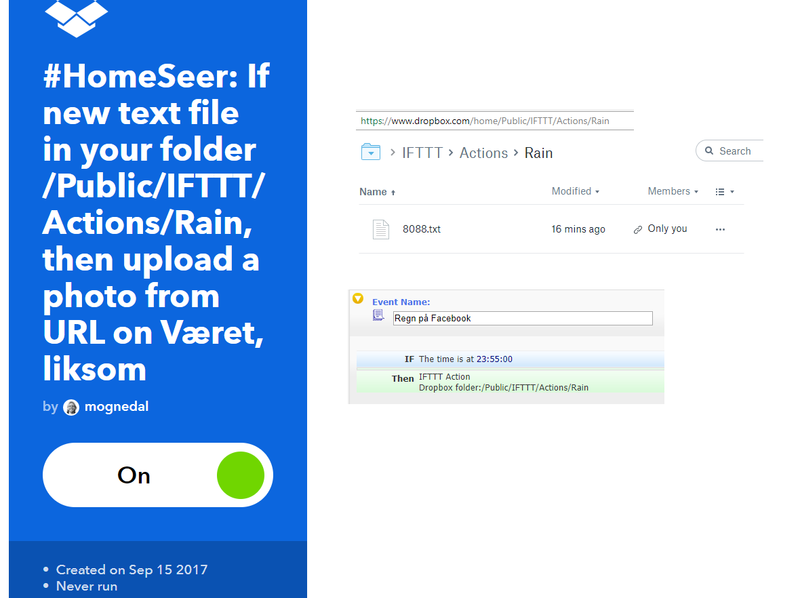 So you need to make sure that the IFTTT plugin uses a different name each time by using advanced mode to provide a name for the file with a replacement variable that will change over time. I used $time in the example below but I think you could use a timer or a counter. Can I use $date too? Some of my Events trigger at the same time every day. yeah $date should work, anyway if this workaround work for you, I will update the plugin so that it write different file name automatically. I don't have any fields for entering the file name....? My version os 3.0.1.2 and as far as I can tell, it's the latest version (and I couldn't find it in the beta section either).